"D'Annunzio" redirects here. For the film, see D'Annunzio (film). For the Scottish television presenter, see Romana D'Annunzio. General Gabriele D'Annunzio, Prince of Montenevoso, Duke of Gallese OMS CMG MVM (Italian pronunciation: [ɡabriˈɛːle danˈnuntsjo]; 12 March 1863 – 1 March 1938), sometimes spelled d'Annunzio, was an Italian poet, journalist, playwright and soldier during World War I. He occupied a prominent place in Italian literature from 1889 to 1910 and later political life from 1914 to 1924. He was often referred to under the epithets Il Vate ("the Poet") or Il Profeta ("the Prophet"). Some of his ideas and aesthetics influenced Italian fascism and the style of Benito Mussolini and, thereby, Adolf Hitler; he has been described as "the father of Fascism". D'Annunzio was associated with the Decadent movement in his literary works, which interplayed closely with French Symbolism and British Aestheticism. Such works represented a turn against the naturalism of the preceding romantics and was both sensuous and mystical. He came under the influence of Friedrich Nietzsche which would find outlets in his literary and later political contributions. His affairs with several women, including Eleonora Duse and Luisa Casati, received public attention. During the First World War, perception of D'Annunzio in Italy transformed from literary figure into a national war hero. He was associated with the elite Arditi storm troops of the Italian Army and took part in actions such as the Flight over Vienna. As part of an Italian nationalist reaction against the Paris Peace Conference, he set up the short-lived Italian Regency of Carnaro in Fiume with himself as Duce. The constitution made "music" the fundamental principle of the state and was corporatist in nature. D'Annunzio was born in the township of Pescara, in the region of Abruzzo, the son of a wealthy landowner and mayor of the town Francesco Paolo Rapagnetta D'Annunzio (1831–1893) and his wife Luisa de Benedictis (1839-1917). His father had originally been born plain Rapagnetta (the name of his single mother), but at the age of 13 had been adopted by a childless rich uncle Antonio D'Annunzio. Legend has it that he was initially baptized Gaetano and given the name of Gabriele later in childhood, because of his angelic looks, a story that has largely been disproven. His precocious talent was recognised early in life, and he was sent to school at the Liceo Cicognini in Prato, Tuscany. He published his first poetry while still at school at the age of sixteen — a small volume of verses called Primo Vere (1879). Influenced by Giosuè Carducci's Odi barbare, he posed side by side some almost brutal imitations of Lorenzo Stecchetti, the fashionable poet of Postuma, with translations from the Latin. His verse was distinguished by such agile grace that Giuseppe Chiarini on reading them brought the unknown youth before the public in an enthusiastic article. In 1881 D'Annunzio entered the University of Rome La Sapienza, where he became a member of various literary groups, including Cronaca Bizantina, and wrote articles and criticism for local newspapers. In those university years he started to promote Italian irredentism. He published Canto novo (1882), Terra vergine (1882), L'intermezzo di rime (1883), Il libro delle vergini (1884) and the greater part of the short stories that were afterwards collected under the general title of San Pantaleone (1886). Canto novo contains poems full of pulsating youth and the promise of power, some descriptive of the sea and some of the Abruzzese landscape, commented on and completed in prose by Terra vergine, the latter a collection of short stories dealing in radiant language with the peasant life of the author's native province. Intermezzo di rime is the beginning of D'Annunzio's second and characteristic manner. His conception of style was new, and he chose to express all the most subtle vibrations of voluptuous life. Both style and contents began to startle his critics; some who had greeted him as an enfant prodige rejected him as a perverter of public morals, whilst others hailed him as one bringing a breath of fresh air and an impulse of new vitality into the somewhat prim, lifeless work hitherto produced. Meanwhile, the review of Angelo Sommaruga perished in the midst of scandal, and his group of young authors found itself dispersed. Some entered the teaching career and were lost to literature, others threw themselves into journalism. 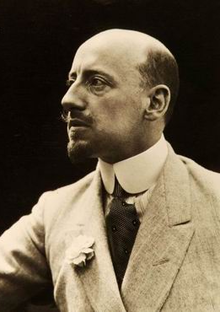 Gabriele D'Annunzio took this latter course, and joined the staff of the Tribuna, under the pseudonym of "Duca Minimo". Here he wrote Il libro d'Isotta (1886), a love poem, in which for the first time he drew inspiration adapted to modern sentiments and passions from the rich colours of the Renaissance. Il libro d'Isotta is interesting also, because in it one can find most of the germs of his future work, just as in Intermezzo melico and in certain ballads and sonnets one can find descriptions and emotions which later went to form the aesthetic contents of Il piacere, Il trionfo della morte and Elegie romane (1892). 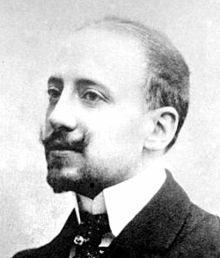 D'Annunzio's first novel Il Piacere (1889, translated into English as The Child of Pleasure) was followed in 1891 by Giovanni Episcopo, and in 1892 by L'innocente (The Intruder). These three novels made a profound impression. L'innocente, admirably translated into French by Georges Herelle, brought its author the notice and applause of foreign critics. His next work, Il trionfo della morte (The Triumph of Death) (1894), was followed soon by Le vergini delle rocce (1896) and Il fuoco (1900); the latter is in its descriptions of Venice perhaps the most ardent glorification of a city existing in any language. D'Annunzio's poetic work of this period, in most respects his finest, is represented by Il Poema Paradisiaco (1893), the Odi navali (1893), a superb attempt at civic poetry, and Laudi (1900). A later phase of D'Annunzio's work is his dramatic production, represented by Il sogno di un mattino di primavera (1897), a lyrical fantasia in one act; his Città Morta (1898), written for Sarah Bernhardt. In 1898 he wrote his Sogno di un pomeriggio d'autunno and La Gioconda; in the succeeding year La gloria, an attempt at contemporary political tragedy which met with no success, probably because of the audacity of the personal and political allusions in some of its scenes; and then Francesca da Rimini (1901), a perfect reconstruction of medieval atmosphere and emotion, magnificent in style, and declared by an authoritative Italian critic – Edoardo Boutet – to be the first real, if imperfect, tragedy ever given to the Italian theatre. In 1883, D'Annunzio married Maria Hardouin di Gallese, and had three sons, Mario (1884-1964), Gabriele Maria "Gabriellino" (1886-1945) and Ugo Veniero (1887-1945), but the marriage ended in 1891. In 1894, he began a love affair with the actress Eleonora Duse which became a cause célèbre. He provided leading roles for her in his plays of the time such as La città morta (The Dead City) (1898) and Francesca da Rimini (1901), but the tempestuous relationship finally ended in 1910. After meeting the Marchesa Luisa Casati in 1903, he began a lifelong turbulent on again off again affair with Luisa, that lasted until a few years before his death. In 1897, D'Annunzio was elected to the Chamber of Deputies for a three-year term, where he sat as an independent. By 1910, his daredevil lifestyle had forced him into debt, and he fled to France to escape his creditors. There he collaborated with composer Claude Debussy on a musical play Le martyre de Saint Sébastien (The Martyrdom of St Sebastian), 1911, written for Ida Rubinstein. The Vatican reacted by placing all of his works in the Index of Forbidden Books. The work was not successful as a play, but it has been recorded in adapted versions several times, notably by Pierre Monteux (in French), Leonard Bernstein (sung in French, acted in English), and Michael Tilson Thomas (in French). In 1912 and 1913, D'Annunzio worked with opera composer Pietro Mascagni on his opera Parisina, staying sometimes in a house rented by the composer in Bellevue, near Paris. Italian translation of the propaganda leaflet which D'Annunzio threw from his airplane during his flight above Vienna. After the start of World War I, D'Annunzio returned to Italy and made public speeches in favor of Italy's entry on the side of the Triple Entente. Since taking a flight with Wilbur Wright in 1908, D'Annunzio had been interested in aviation. With the war beginning he volunteered and achieved further celebrity as a fighter pilot, losing the sight of an eye in a flying accident. In February 1918, he took part in a daring, if militarily irrelevant, raid on the harbour of Bakar (known in Italy as La beffa di Buccari, lit. the Bakar Mockery), helping to raise the spirits of the Italian public, still battered by the Caporetto disaster. On 9 August 1918, as commander of the 87th fighter squadron "La Serenissima", he organized one of the great feats of the war, leading nine planes in a 700-mile round trip to drop propaganda leaflets on Vienna. This is called in Italian "il Volo su Vienna", "the Flight over Vienna". The war strengthened his ultra-nationalist and irredentist views, and he campaigned widely for Italy to assume a role alongside her wartime allies as a first-rate European power. Angered by the proposed handing over of the city of Fiume (now Rijeka in Croatia) whose population, outside the suburbs, was mostly Italian, at the Paris Peace Conference, on 12 September 1919, he led the seizure by 2,000 Italian nationalist irregulars of the city, forcing the withdrawal of the inter-Allied (American, British and French) occupying forces. The plotters sought to have Italy annex Fiume, but were denied. Instead, Italy initiated a blockade of Fiume while demanding that the plotters surrender. D'Annunzio then declared Fiume an independent state, the Italian Regency of Carnaro; the Charter of Carnaro foreshadowed much of the later Italian Fascist system, with himself as "Duce" (leader). Some elements of the Royal Italian Navy, such as the destroyer Espero joined up with D'Annunzio's local forces. He attempted to organize an alternative to the League of Nations for (selected) oppressed nations of the world (such as the Irish, whom D'Annunzio attempted to arm in 1920), and sought to make alliances with various separatist groups throughout the Balkans (especially groups of Italians, though also some Slavic and Albanian groups), although without much success. D'Annunzio ignored the Treaty of Rapallo and declared war on Italy itself, only finally surrendering the city in December 1920 after a bombardment by the Italian navy. Gabriele D'Annunzio (in the middle with the stick) with some legionaries (components of the Arditi's department of the Italian Royal Army) in Fiume in 1919. To the right of D'Annunzio, facing him, Lt. Arturo Avolio (commander of the Ardit's department of Bologna Brigade). After the Fiume episode, D'Annunzio retired to his home on Lake Garda and spent his latter years writing and campaigning. Although D'Annunzio had a strong influence on the ideology of Benito Mussolini, he never became directly involved in fascist government politics in Italy. In 1922, shortly before the march on Rome, he was pushed out of a window by an unknown assailant, or perhaps simply slipped and fell out himself while intoxicated. He survived but was badly injured, and only recovered after Mussolini had been appointed Prime Minister. In 1924 he was ennobled by King Victor Emmanuel III and given the hereditary title of Prince of Montenevoso (Italian: Principe di Montenevoso). In 1937 he was made president of the Royal Academy of Italy. D'Annunzio died in 1938 of a stroke, at his home in Gardone Riviera. He was given a state funeral by Mussolini and was interred in a magnificent tomb constructed of white marble at Il Vittoriale degli Italiani. His son Gabriellino D'Annunzio became a film director. His 1921 film The Ship was based on a novel by his father. In 1924, he co-directed the historical epic Quo Vadis, an expensive failure, before retiring from filmmaking. D'Annunzio is often seen as a precursor of the ideals and techniques of Italian fascism. His political ideals emerged in Fiume when he coauthored a constitution with syndicalist Alceste de Ambris, the Charter of Carnaro. De Ambris provided the legal and political framework, to which D'Annunzio added his skills as a poet. De Ambris was the leader of a group of Italian seamen who had mutinied and then given their vessel to the service of D'Annunzio. The constitution established a corporatist state, with nine corporations to represent the different sectors of the economy (workers, employers, professionals), and a tenth (D'Annunzio's invention) to represent the "superior" human beings (heroes, poets, prophets, supermen). The Carta also declared that music was the fundamental principle of the state. It was rather the culture of dictatorship that Benito Mussolini imitated and learned from D'Annunzio. D'Annunzio has been described as the John the Baptist of Italian Fascism, as virtually the entire ritual of Fascism was invented by D'Annunzio during his occupation of Fiume and his leadership of the Italian Regency of Carnaro. These included the balcony address, the Roman salute, the cries of "Eia, eia, eia! Alala!" taken from the Achilles' cry in the Iliad, the dramatic and rhetorical dialogue with the crowd, and the use of religious symbols in new secular settings. It also included his method of government in Fiume: the economics of the corporate state; stage tricks; large emotive nationalistic public rituals; and blackshirted followers, the Arditi, with their disciplined, bestial responses and strongarm repression of dissent. He was even said to have originated the practice of forcibly dosing opponents with large amounts of castor oil, a very effective laxative, to humiliate, disable or kill them, a practice which became a common tool of Mussolini's blackshirts. D'Annunzio advocated an expansionist Italian foreign policy and applauded the invasion of Ethiopia. This famous poet, novelist and war hero was a self-proclaimed Superman. He was the outstanding interventionist in May 1915 and his dramatic exploits during the war won him national and international acclaim. In September 1919 he gathered together his 'legions' and captured the disputed seaport of Fiume. He held it for over a year and it was he who popularised the black shirts, the balcony speeches, the promulgation of ambitious charters and the entire choreography of street parades and ceremonies. He even planned a march on Rome. One historian had rightly described him as the 'First Duce' and Mussolini must have heaved a sigh of relief when he was driven from Fiume in December 1920 and his followers were dispersed. But he remained a threat to Mussolini and in 1921 Fascists like Balbo seriously considered turning to him for leadership. In contrast Mussolini vacillated from left to right at this time. Although Mussolini's fascism was heavily influenced by the Carta del Carnaro, the constitution for Fiume written by Alceste De Ambris and D'Annunzio, neither wanted to play an active part in the new movement, both refusing when asked by Fascist supporters to run in the elections of 15 May 1921. 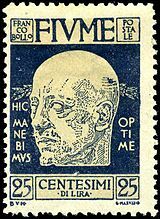 Before the March on Rome, De Ambris even went so far as to depict the Fascist movement as: "a filthy pawn in Mister Giolitti's game of chess, and made out of the least dignified section of the bourgeoisie"
D'Annunzio was seriously injured when he fell out of a window on 13 August 1922; subsequently the planned "meeting for national pacification" with Francesco Saverio Nitti and Mussolini was cancelled. The incident was never explained and is considered by some historians an attempt to murder him, motivated by his popularity. Despite D'Annunzio's retreat from active public life after this event, the Duce still found it necessary to regularly dole out funds to D'Annunzio as a bribe for not re-entering the political arena. When asked about this by a close friend, Mussolini purportedly stated: "When you have a rotten tooth you have two possibilities open to you: either you pull the tooth or you fill it with gold. With D'Annunzio I have chosen for the latter treatment." Nonetheless, D'Annunzio kept attempting to intervene in politics almost until his death in 1938. He wrote to Mussolini in 1933 to try to convince him not to take part in the Axis pact with Hitler. In 1934, he tried to disrupt the relationship between Hitler and Mussolini after their meeting, even writing a satirical pamphlet about Hitler. Again, in September 1937, D'Annunzio met with the Duce at the Verona train station to convince him to leave the Axis alliance. Mussolini in 1944 admitted to have made a mistake not following his advice. At the height of his success, D'Annunzio was celebrated for the originality, power and decadence of his writing. Although his work had immense impact across Europe, and influenced generations of Italian writers, his fin de siècle works are now little known, and his literary reputation has always been clouded by his fascist associations. Indeed, even before his fascist period, he had his strong detractors. A New York Times review in 1898 of his novel The Intruder referred to him as "evil", "entirely selfish and corrupt". Three weeks into its December 1901 run at the Teatro Constanzi in Rome, his tragedy Francesca da Rimini was banned by the censor on grounds of morality. A prolific writer, his novels in Italian include Il piacere (The Child of Pleasure, 1889), Il trionfo della morte (The Triumph of Death, 1894), and Le vergini delle rocce (The Virgins of the Rocks, 1896). He wrote the screenplay to the feature film Cabiria (1914) based on episodes from the Second Punic War. D'Annunzio's literary creations were strongly influenced by the French Symbolist school, and contain episodes of striking violence and depictions of abnormal mental states interspersed with gorgeously imagined scenes. One of D'Annunzio's most significant novels, scandalous in its day, is Il fuoco (The Flame of Life) of 1900, in which he portrays himself as the Nietzschean Superman Stelio Effrena, in a fictionalized account of his love affair with Eleonora Duse. His short stories showed the influence of Guy de Maupassant. He was also associated with the bizarre Italian noblewoman Luisa Casati, an influence on his novels and one of his mistresses. The work of d' Annunzio, although by many of the younger generation injudiciously and extravagantly admired, is almost the most important literary work given to Italy since the days when the great classics welded her varying dialects into a fixed language. The psychological inspiration of his novels has come to him from many sources—French, Russian, Scandinavian, German—and in much of his earlier work there is little fundamental originality. His creative power is intense and searching, but narrow and personal; his heroes and heroines are little more than one same type monotonously facing a different problem at a different phase of life. But the faultlessness of his style and the wealth of his language have been approached by none of his contemporaries, whom his genius has somewhat paralysed. In his later work [meaning as of 1911], when he begins drawing his inspiration from the traditions of bygone Italy in her glorious centuries, a current of real life seems to run through the veins of his personages. And the lasting merit of D'Annunzio, his real value to the literature of his country, consists precisely in that he opened up the closed mine of its former life as a source of inspiration for the present and of hope for the future, and created a language, neither pompous nor vulgar, drawn from every source and district suited to the requirements of modern thought, yet absolutely classical, borrowed from none, and, independently of the thought it may be used to express, a thing of intrinsic beauty. As his sight became clearer and his purpose strengthened, as exaggerations, affectations, and moods dropped away from his conceptions, his work became more and more typical Latin work, upheld by the ideal of an Italian Renaissance. In Italy some of his poetic works remain popular, most notably his poem "La pioggia nel pineto" (The Rain in the Pinewood), which exemplifies his linguistic virtuosity as well as the sensuousness of his poetry. D'Annunzio's life and work are commemorated in a museum, Il Vittoriale degli Italiani. He planned and developed it himself, adjacent to his villa at Gardone Riviera on the southwest bank of Lake Garda, between 1923 and his death. Now a national monument, it is a complex of military museum, library, literary and historical archive, theatre, war memorial and mausoleum. The museum preserves his torpedo boat MAS 96 and the SVA-5 aircraft he flew over Vienna. His birthplace is also open to the public as a museum, Birthplace of Gabriele D'Annunzio Museum in Pescara. His epistolary work, Solus ad solam, was published posthumously. D'Annunzio University in Chieti and Pescara is named after him. The Brescia Airport is named after him. In his honour, the Chilean poetess Lucila Godoy Alcayaga, 1945 Nobel Prize in Literature, took the first name of her pseudonym, Gabriela Mistral. Ernesto Giménez Caballero was given the nickname the "Spanish D'Annunzio". The play Tamara is based on his meeting with the painter Tamara de Lempicka. The Pike: Gabriele D'Annunzio, Poet, Seducer and Preacher of War, a modern reappraisal of his life and work. This page is based on the Wikipedia article Gabriele D'Annunzio; it is used under the Creative Commons Attribution-ShareAlike 3.0 Unported License (CC-BY-SA). You may redistribute it, verbatim or modified, providing that you comply with the terms of the CC-BY-SA.